The conference String-Math 2014 was held from June 9–13, 2014, at the University of Alberta. 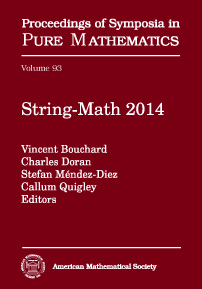 This edition of String-Math is the first to include satellite workshops: “String-Math Summer School” (held from June 2–6, 2014, at the University of British Columbia), “Calabi-Yau Manifolds and their Moduli” (held from June 14–18, 2014, at the University of Alberta), and “Quantum Curves and Quantum Knot Invariants” (held from June 16–20, 2014, at the Banff International Research Station). This volume presents the proceedings of the conference and satellite workshops. For mathematics, string theory has been a source of many significant inspirations, ranging from Seiberg-Witten theory in four-manifolds, to enumerative geometry and Gromov-Witten theory in algebraic geometry, to work on the Jones polynomial in knot theory, to recent progress in the geometric Langlands program and the development of derived algebraic geometry and n-category theory. In the other direction, mathematics has provided physicists with powerful tools, ranging from powerful differential geometric techniques for solving or analyzing key partial differential equations, to toric geometry, to K-theory and derived categories in D-branes, to the analysis of Calabi-Yau manifolds and string compactifications, to modular forms and other arithmetic techniques. Articles in this book address many of these topics. Advanced graduate students, post-docs, and most Ph.D. mathematicians and mathematical physicists interested in string theory and quantum field theory.